1.) The blood is a powerful reminder that sin brings death, both as a consequence and a covering. Imagine how powerful the lesson was for small children who had to allow family lambs to be sacrificed for their sins every year. 2.) We tend to stop with the shedding of the blood and ignore the application of the blood. We are not masochistic people with vampire-like fascinations. The blood of Christ was shed once for all, but it must also be applied. 3.) The blood applied to our life is not merely for the remission of sins, it also allows us to enter into the presence of God. We do not hear it much today, but there was a time when it was common to hear believers “plead the blood of Christ.” This is more than symbolic. It is a spiritual reality. The author of Hebrews tells us to be confident that we can enter into the holy place by the blood of Jesus (Heb. 10:19). Next time you need to enter into the presence of Christ cover yourself with His blood. 4.) The blood enables us to overcome the evil one. Revelation 12:11 tells us that we will overcome Satan by the blood of the Lamb and the word of our testimony. The key to overcoming evil in your life is to stand on the blood of Jesus Christ. So, how do we apply the blood of Christ to our life? Consider David’s sin involving Bathsheba. He coveted another man’s wife, lusted after her, committed adultery with her, lied to cover his sin, and finally commissioned a plan to have her husband killed. It is not a very nice picture of the heart of the man after God’s own heart. David is fully aware of his sin in Psalm 51. He references his sin, iniquity, transgressions and evil deeds six times in the first four verses. In verse five he recognizes that the pervasiveness of sin in his life goes all the back to his very conception. David understands that his soul is utterly riddled with sin. So he asks God to use hyssop in order to purify him. Hyssop? It seems a strange reference at first glance. It is a word that is only used twelve times in the bible, mostly in descriptions of three rituals. So what is it? Hyssop is a plant or family of plants that commonly grew in the Ancient Near East. The first biblical reference to hyssop is in Exodus 12:22, when Moses instructed the Israelites to dip the plant in blood and use it to apply to blood to the doorposts of their dwellings. The blood was symbolic of the fact that God’s judgment would not be applied to the Israelites when He came to judge the people of Egypt. Destruction would come to every house that was not painted with the blood of the passover lamb. The second time that hyssop is mentioned is in the ceremony of restoring cleansed lepers to the community in Leviticus 14. Once again the hyssop was used to apply blood, this time sprinkled seven times on the one who is to be cleansed. The third and final time that we see hyssop used ritualistically is in Numbers 19 where it is used to apply the blood and bring about purification. In the New Testament hyssop is mentioned only twice. Once in the book of Hebrews in recounting Moses’ use of it in Exodus, and once at Calvary when it was used to give Jesus sour wine. So, in David’s prayer to be cleansed with hyssop he is both looking back and looking forward. He is recognizing the need he has to have God passover his sin, restore him to right relationship, and purify him from his iniquities. And he is looking forward to the only blood that could truly do those things, the blood of the holy passover lamb, Jesus Christ. If you need God to passover your sin, restore your relationship, or purify your iniquities–or if you simply need to enter boldly into his presence–start by doing this: apply the blood. I enjoyed this, it got me to thinking about how so many sing about the blood, but not truly realizing the significance of such, the meaning and the symbolic-ness of that which this Precious Blood comes from. 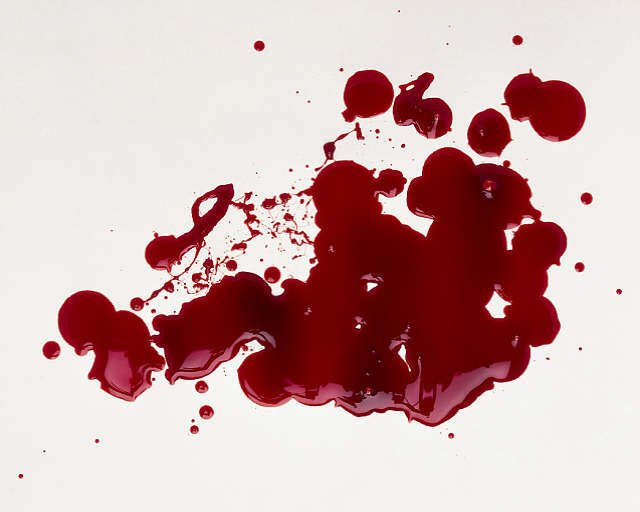 It is this very blood that does cleanse us for the remission of our sins. Also reminded of Moses and the Isrealites applying it to the blood posts of the door. Thank you for sharing forth! I grew up in a home where every day before I would walk out the door to go to school, my mom would pray over me at the door and plead the blood of Jesus over me. Later in years I was doing some reading in the bible and realized that the blood of the lamb was placed over the door posts of the homes of believers, and the death angel would pass by their home because it could see the blood of the lamb on the door… clearly the blood of the lamb was a prophetic symbol of the blood of Jesus, the lamb who was slain for our sins. So now as an adult I pray that same prayer multiple times a day over my husband, children and myself…. one time I was walking a neighbors dog and I rounded a street corner and heard the voice of the Holy Spirit speak to me and say, “you didnt plead the blood over yourself yet today!” I said,, oh You’re right! So immediatly I prayed as I continued walking….. I kid you not,,, not even 2 minutes later, two pitt-type dogs walked out of a back yard and began growling and getting in attack position to get the dog I was walking…. I nervously asked the owner who was working on his car, and who didnt know the dogs were loose, if they bite…… he looked at me,, looked at his dogs and yelled YES!!! immediately the two dogs attacked the dog I was walking and bit on him so hard that the owner had to pry the mouth off my dog…… I was screaming JESUS histarically and pulling the dog I was walking by the leash as if magically the other dog would let loose and we could get away…..the dog Iwas walking looked up at me like, “dude… stop pulling!” ha ah… so I stopped pulling. The owner got his dogs jaw loose and I quickly walked off with my dog ……. as Im walking away saying, “its gonna be ok” the owner is saying back,,, i’ll pay for damages! it was absolutly crazy…. it all ended up ok,, the dog got stiches, the owner of the other dog paid for it and everything was fine……. I realized later that had I also plead the blood of Jesus over that dog as I was praying for myself, then nothing would have happened to it…. I also realized that had I not plead the blood of Jesus over myself, I could have been pretty badly hurt as well……. anyway, I am grateful for a mom who taught me to pray that way. I will in turn pass it to my own children as they learn from me by example…. Wow, Cindie! I guess the Lord made His point that day! Thanks for sharing that story! Love the post. Christians do not realize the power of the blood, and non-Christians often don’t understand it altogether. “lesson was for small children who had to allow family lambs to be sacrificed for their sins every year.” — Speaking of not realizing, I am working on a post about lite Christianity – seeing the stories as stories and not realizing the very real emotions of the people in the stories, such as the children you mentioned. Thanks, Angie. And I’m glad I found your blog. Blessings. thank you for this post.. the blood is mentioned too little these days.. very sad..
thank you for visiting my new blog, and for liking my post Beauty in the Moon Rise. Thank you for reading, and for the comment. I am glad to have found your blog. Blessings!